Mar 22, 2019 | What Am I Reading? 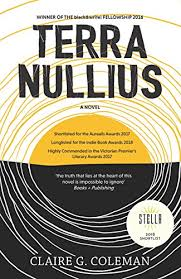 Rather ashamed to admit that I had not yet read Claire G. Coleman’s award-winning Terra Nullius (Hachette Australia Books 2017), but after meeting Claire at a Griffith Review launch, this book was immediately moved up the TBR pile. And what a clever and thought-provoking novel it is. Terra Nullius begins as an account of Australia’s grim past in relation to the invasion by English settlers and the imprisonment, enslavement and massacre of the Indigenous population. Children are stolen, families are broken, communities are shattered, language is outlawed and ‘re-education’ is the order of the day as the newcomers assert their ‘moral and intellectual superiority’ and attempt to ‘tame the savage natives’. So far, so familiar. A bleak retelling of our appalling history, peppered with graphic and visceral accounts of violence and inhumane treatment that is uncomfortable to read and difficult to confront. But halfway through this novel, the narrative shifts in a way that is both ingenious and original. To say too much would be to spoil the dawning recognition of those yet to read this book, but enough to say that the line between the past and the future becomes blurred, and everything we thought we had read until that point suddenly comes into focus as something else altogether. The effect of this is that the story that we thought was about something that happened to ‘them’, becomes something that is happening to ‘us’, and this dramatic kaleidoscopic shift is, quite frankly, mind-blowing. This book shows us how much we don’t know about what we don’t know, and changes the lens through which we view the invasion (‘colonisation’, ‘settlement’) of this country. But apart from the unique structure, the story itself is engaging and compelling. The main characters – Jacky, Sister Bagra, Esperance, Devil, Rohan and Johnny Star – are highly relatable and fascinating. The writing itself is often phrased in an almost naïve and straightforward beauty. Every chapter opens with an extract from an ‘historical document’, placing what comes afterwards in context. This may be a work of fiction but the truths it explores are very real. The issues of Australia’s sordid past, and our country’s current position on refugees or Indigenous people or anyone who is ‘other’, are laid bare in this sharp and cutting social commentary.